United States players celebrate after defeating Canada in the women's ice hockey gold medal match during the Pyeongchang 2018 Olympic Winter Games at Gangneung Hockey Centre. 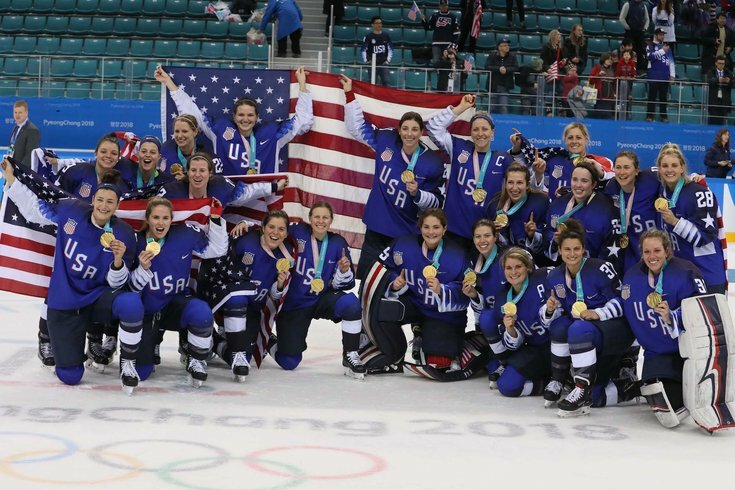 The 2018 Winter Olympics in Pyeongchang, South Korea have been over for more than a week, but the victory tour for the U.S. Women's Hockey team is still in full swing. Truth be told, the 2018 Winter Olympics provided a strong platform for the female athletes of the United States. It was a huge validation of the importance of Title IX, and further evidence that athletes need not "stay in their lane" or "shut up and dribble." The eventual stars of the show were the U.S. women hockey players. In what's become a routine grudge match against Team Canada, the Americans won after Jocelyne Lamoureux-Davidson scored on the team's sixth shoot-out attempt, which set up goalkeeper Maddie Rooney's gold medal-clinching save against Canada's Meghan Agosta. Lamoureux-Davidson's glorious goal was dubbed "Oops I did it again," and it will be replayed over and over again in super slow motion to highlight its beauty. It was a stupendous effort in the shootout by any standard: Male or female. The beauty of that goal is that it wasn't just about a female athlete. It was simply an athletic move by a great hockey player. The victory over Canada was a study in grim determination in a heated rivalry every bit as emotional as each time the Flyers take the ice against the Pittsburgh Penguins, or the Eagles face the Cowboys. If that sounds corny, well, you're simply missing the whole value of the Olympic Games. Like all Olympians, these women wait for the chance to state their case once every four years, and four years of preparation can be turned upside down with one subpar performance. That is exactly why some of the Olympic mystique disappeared when team-sport professionals got involved. NHL players have their own little tourney called the Stanley Cup playoffs, and their presence in the previous games overshadowed the athletes who consider scaling Mount Olympus as their championship. Also somewhat lost was the journey the American women took to get that gold medal. This is a team that threatened to walk out of the World Championships if they were not treated on a somewhat-equal basis with the men in terms of money for training. American women used these Olympic Games to prove that great gains can be made when they're given equal footing. As the "Me Too" movement was taking hold, the U.S. Women flat-out stated that they would not be treated as also-rans. They stood their ground, and their bold move literally paid off. From racial strife to political rights, such statements are often made in sports. They serve as proof that athletes do not have to shut up and skate in their lane. The success of American women is so many sports is a testament to strides the gender has made across the athletic landscape in the United States. Now, girls and young women have the advantage of learning life lessons through sports. They can build a lifetime of strong relationships through competition at any level. The U.S. Women's Hockey Team weren't the only big winners in PyeongChang. American women also won a gold medal when 17-year old Chloe Kim became the sport's youngest gold-medal winner with her performance in the snowboard slopestyle competition. Kim also won the prize for brightest smile and feel-good moment for the sheer joy she displayed on the medal stand. The U.S. women's cross-country skiing team also made history with America's first-ever medal in that event. It was, shockingly, a gold. On the slopes, Jamie Anderson won her back-to-back gold in snowboarding slopestyle, and the graceful Mikaela Shiffrin earned top honors in the giant slalom. Anderson also won silver in snowboard big air as did Shiffrin in the slalom. Also taking the stand as silver medalists was Elana Meyers Taylor and Lauren Gibbs in bobsledding. Bronze medals went to Arielle Gold in the snowboarding half pipe and Brita Sigourney in freestyle skiing halfpipe. While it didn't involve winning a medal, Mirai Nagasu became the first American woman to land a triple Axel in figure skating competition. Meanwhile, the biggest "victory" for American women might have come in what some viewed as a disappointing end for Lindsey Vonn's Olympic career. America's greatest skier did not get her dream ending of having a gold medal placed around her neck. Instead, she finished with a bronze in alpine skiing. Still, at 33 years old, she was the oldest medal winner at the Games. Vonn's story - as told through the games - is one of great grit, determination and amazing comebacks from horrific injuries. This was not just a story of a great female athlete, but of a great American athlete. Vonn is a competitor who was proud to time and again to wear the red, white and blue from event to event, in competitions across the globe, against a couple of generations of rivals. She was not afraid to speak her mind on social issues, and even less afraid to tell her critics where they could go when they suggested they would root against an American because she held differing political views. From 33-year-old Lindsey Vonn, to 17-year-old Chloe Kim, to the shoulder-pad-to shoulder-pad camaraderie of the U.S. women's hockey team, and so on down the line, the American women used these Olympic Games to prove that great gains can be made when they're given equal footing.